CUB SCOUTS FROM PACK 2 CUMBERLAND HILL celebrate as they finish cleaning the area around J.J. McLaughlin Cumberland Hill School Saturday, part of the town- wide Yellow Bag Day litter cleanup effort. They are, from left, Aaron Joyce, Charley Martins, Hunter Berry, Ben Scholl, Tyler Weldon, Jacob Weldon, Tommy Hawkins, Aaron Lessard, Ben Watson and Joe Phillips. More than 250 volunteers participated in Cumberland and Lincoln. See more photos on pages 8-9. 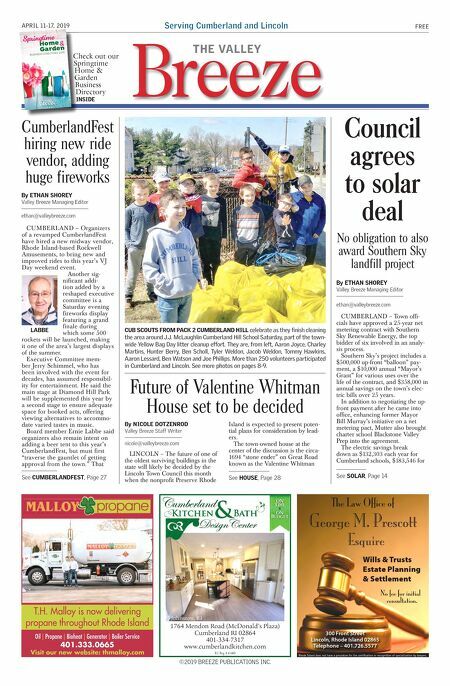 Council agrees to solar deal No obligation to also award Southern Sky landfill project CUMBERLAND – Town offi- cials have approved a 25-year net metering contract with Southern Sky Renewable Energy, the top bidder of six involved in an analy- sis process. Southern Sky's project includes a $500,000 up-front "balloon" pay- ment, a $10,000 annual "Mayor's Grant" for various uses over the life of the contract, and $358,000 in annual savings on the town's elec- tric bills over 25 years. In addition to negotiating the up- front payment after he came into office, enhancing former Mayor Bill Murray's initiative on a net metering pact, Mutter also brought charter school Blackstone Valley Prep into the agreement. The electric savings break down as $132,303 each year for Cumberland schools, $183,546 for By ETHAN SHOREY Valley Breeze Managing Editor ethan@valleybreeze.com See SOLAR, Page 14 CUMBERLAND – Organizers of a revamped CumberlandFest have hired a new midway vendor, Rhode Island-based Rockwell Amusements, to bring new and improved rides to this year's VJ Day weekend event. Another sig- nificant addi- tion added by a reshaped executive committee is a Saturday evening fireworks display featuring a grand finale during which some 500 rockets will be launched, making it one of the area's largest displays of the summer. Executive Committee mem- ber Jerry Schimmel, who has been involved with the event for decades, has assumed responsibil- ity for entertainment. He said the main stage at Diamond Hill Park will be supplemented this year by a second stage to ensure adequate space for booked acts, offering viewing alternatives to accommo- date varied tastes in music. Board member Ernie Labbe said organizers also remain intent on adding a beer tent to this year's CumberlandFest, but must first "traverse the gauntlet of getting approval from the town." That CumberlandFest hiring new ride vendor, adding huge fireworks By ETHAN SHOREY Valley Breeze Managing Editor ethan@valleybreeze.com LABBE See CUMBERLANDFEST, Page 27 LINCOLN – The future of one of the oldest surviving buildings in the state will likely be decided by the Lincoln Town Council this month when the nonprofit Preserve Rhode Island is expected to present poten- tial plans for consideration by lead- ers. The town-owned house at the center of the discussion is the circa- 1694 "stone ender" on Great Road known as the Valentine Whitman Future of Valentine Whitman House set to be decided By NICOLE DOTZENROD Valley Breeze Staff Writer nicole@valleybreeze.com See HOUSE, Page 28 ©2019 BREEZE PUBLICATIONS INC. Serving Cumberland and Lincoln Breeze THE VALLEY FREE APRIL 11-17, 2019 Johnston, RI 1764 Mendon Road (McDonald's Plaza) Cumberland RI 02864 401-334-7317 www.cumberlandkitchen.com R.I. Reg. # 41460 Oil | Propane | Bioheat | Generator | Boiler Service 401.333.0665 Visit our new website: thmalloy.com T.H. Malloy is now delivering propane throughout Rhode Island Wills & Trusts Estate Planning & Settlement The Law Office of George M. Prescott Esquire Rhode Island does not have a procedure for the certification or recognition of specialization by lawyers. 300 Front Street Lincoln, Rhode Island 02865 Telephone – 401.726.5577 No fee for initial consultation. Check out our Springtime Home & Garden Business Directory INSIDE Check out our Springtime Home & Garden Business Directory INSIDE Published by BUSINESS DIRECTORY 2019 Home Garden Springtime & ©2019 BREEZE PUBLICATIONS INC.